The 36-foot Uniflite, KEALIA, under Capt. Mike Harlans direction was on the world-famous Kona "Grounds" pulling a spread of lures containing a Joe Yee Super Plunger that a lurking grander couldn't resist. Pat Smith and Andrea Stamiforth rotated the angling duties for the next hour. 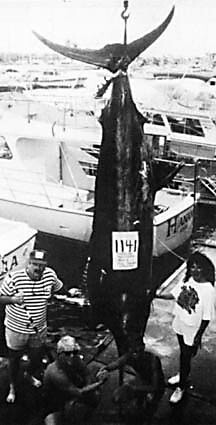 The captain was 22 years old and this fish capped off a seven-trip run where a marlin was caught on each trip.